Bangladesh, the country and its economy, is full of contradictions. To list a couple, while it is one of the world’s fastest growing nations, it has pockets of extreme poverty and malnutrition in urban and rural areas. Another paradox: for the last two decades it has been ruled by two political parties, the Awami League and the Bangladesh Nationalist Party, led by two head-strong leaders, who never can seem to agree on anything, but ran the gauntlet and survived many potentially dangerous threats, including religious fundamentalism, military takeovers, and internal revolt, to its fledgling democracy. The success story of Bangladesh is impressive. Since 1971, when the country was born, the growth rate of GDP is an annual average of 5% reaching a giddying level of 7% in recent years. Its performance has enabled it to join the elite Group of Eleven (known by the numeronym N-11) countries which along with BRIC (Brazil, Russia, India, and China) are expected to dominate the world economy in the 21st century. In contrast, when Bangladesh gained independence from Pakistan in 1971 after a nine-month long War of Liberation, the infrastructure it inherited was in ruins, the economy was in shambles, and almost 10 million people, out of 75 million, were displaced. While the journey since then has been uneven at times, it has been steady, and Bangladesh’s per capita income has risen from $200 in 1972 to $1,000 in 2013 and our nation has set its eyes on joining the rank of middle-income countries by 2021. Bangladesh, unfortunately, is increasingly turning into a polarized society where the very rich industrialists, politicians, and real-estate magnates–who spend their Eid vacations in Singapore and Thailand and think nothing of celebrating New Year’s Eve in Calcutta or Bangkok—coexist with the homeless and the poor who lack the basic necessities of life. Like its big neighbor India, it has large metropolitan areas which also harbor pockets of urban slums and the homeless children in both rural and urban areas. However, Bangladesh is also the birthplace of many innovations, including the Grameen Bank micro-credit system and oral rehydration for cholera victims, and has achieved a high rate of literacy and low fertility rate which dropped from 7 to 2.4 within three decades. At a more disaggregated level, its achievement in the area of poverty reduction, removal of illiteracy, employment for women, and health and population growth is miraculous and in spite of periodic political turmoil and setbacks, it has continued to march forward in these areas. Bangladesh has moved away from an economy dependent on agriculture to one where its manufacturing and services sector contribute a lion’s share of GDP. In 1972, 56% of its exports consisted of raw jute and jute products whereas in 2012-13woven and knit garments brought in 75% of its export earnings. As the Table 1 shows, its rate of globalization is on a par with India and China. In addition, Bangladeshis working overseas remit more than $12 billion annually and provide a safety net to cushion the impact of external shocks. The remarkable economic achievement can be appreciated only if one puts it in context. A small over-populated country with a population density of 876 per sq km, the country started with very few natural resources and is frequently ravaged by natural disasters, such as floods, hurricane, and tidal waves. Additionally, the country has very scant energy sources, except natural gas, and is a flat land criss crossed by rivers and canals which wash away roads and bridges during the monsoon season. A country which Henry Kissinger, the former US Secretary of State, once labeled as an international basket case has defied all odds and is playing a major role in climate change negotiations, international security in Africa and the Middle East, and grass-roots economic development from Haiti to Afghanistan, and poised to join the pantheon of nations that will play a major role in global economic growth in the next decades. 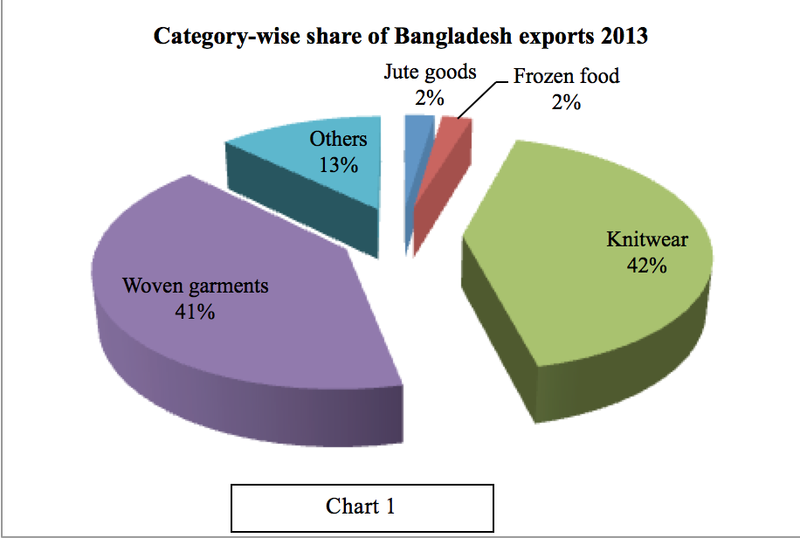 Bangladesh’s economic growth has been aided by rapid expansion of its export-oriented ready-made garments (RMG) sector. With a modest beginning in the mid-seventies, the RMG industry has experienced a spectacular growth over the years and has risen to one of the top players in the global apparel industry. For years, RMG has outperformed other local industries as a strong export earner, and has become the third largest (after China and Italy) clothing exporter to the rest of the world, with exports jumping from $7.9 billion in 2005-2006 to $19.1 billion in 2011-12. However, recent industrial accidents in RMG factories have tarnished its reputation, but barely made any dent in its export performance. It needs to be mentioned that factory owners and the government have taken initiatives to improve working conditions, enforce industrial safety regulations, and increase workers’ earnings. 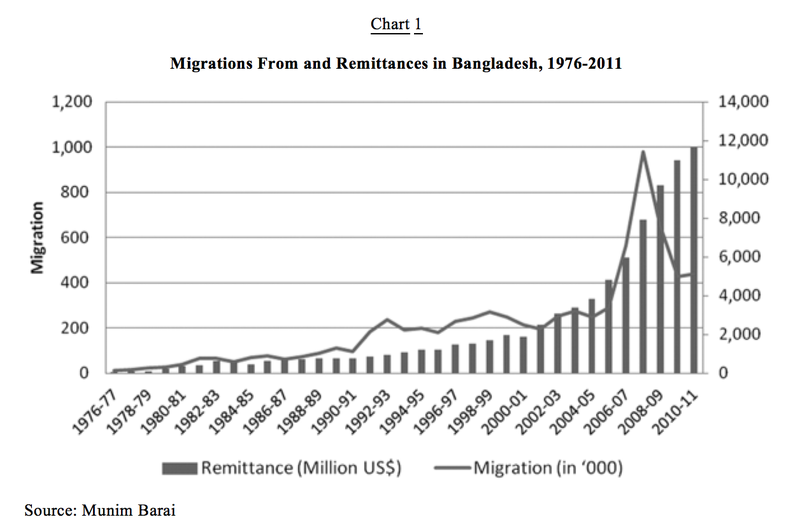 Intertwined with Bangladesh’s prosperity is the migration of Bangladeshi workers abroad for work, and the reverse flow of remittances that provide a steady and invaluable source of foreign exchange for the country. According to Bangladesh Bureau of Manpower, Employment and Training, over 6 million Bangladeshis are working overseas, 31% of which are in Saudi Arabia and 24% in the United Arab Emirates. As seen in Chart 1, remittances increased at a compound rate of over 15% during 1972-2011, reaching a level of US $12 billion in 2012. This inflow has contributed significantly to the healthy foreign exchange reserve of over $13 billion at the end of 2012, and has proven to be a more stable source of investment funds than official development assistance (ODA) and foreign direct investment (FDI). As I indicate earlier, Bangladesh is by no means a land of milk and honey. Poor employment growth, inequality of income, proletarianization, chronic hunger, and disease are some of the areas that the political leaders and civil society will need to address in the coming years. For example, the rate of underemployment went up from 17.6 percent in 1995-96 to 24.5 percent in 2005-06 which might explain the very modest growth of real wage rate in agriculture and non-agriculture during this period. Some other data show a sharper increase in underemployment which appears to be camouflaged by the growth in urban wage rate (particularly in the RMG sector) and non-agriculture. Some fear that Bangladesh is perilously close to becoming a two-economy nation, one for the rich and the other for the poor. The challenges in the coming decades are many. According to the Center for Policy Development (CPD) Bangladesh’s growth prospects depends on “raising investment-GDP ratio and lowering capital-output ratio”. In addition, we can recommend increase in DFI and promotion of a friendly investment climate. While the recent rounds of political turmoil and the international backlash triggered by the Rana Plaza collapse appear to have had no negative impact on exports and income in the short run, it may not be so lucky in the future. Abdullah Shibli is an economist and IT professional based in Boston, USA. I like it very much, but I wish, we all could let our both party leaders in Bangladesh know what a shame, that every five years we have to see same kinds of drama again and again. Dear Shibli I have been reading your articles in the Daily Star regularly with great interest and nostalgia. True there are so many achievements to be proud of like several items in the living index such as health sanitation, women’s empowerment and many others including education classes via skype.The list fortunately goes on and on, and you will be pleased to know that Bangladesh is exporting ‘Kota’ sarees to India. I think something needs to be done immediately.It seems the two Ladies are having a great time ‘playing games’ with the fate of the people. Well in that case we should pass a law in the Parliament that no one can hold the office of the PM for more than two terms. (because in the very popular game of cricket there are only two innings). Then what happens if the want to play another Test , in that case the venue is always different, so ………..
Bangladesh is as much my country as it is the politicians. The two ladies have made so many changes in the constitution that the original form and spirit has been washed away . Earlier we saw the looting of national wealth by the BNPees and now we are just witnessing the looting of national wealth by the Awami leaguers . So sad they could not even build the dual rail line between Dhaka and Chittagong.